Kelly Green is a brighter green; however, it is a nice relaxing green. At MyBinding we encourage getting creative and original with your documents, express yourself and your company when you choose your color of comb bindings. None of our plastic binding combs will scratch, chip, peel, or discolor, including this Kelly Green shade. Ranging from 3/16 of an inch to 2 inches, these binding combs can fit any sized project up to 425 pages. The 19 ring design fits any standard comb binding machine and 8.5 x 11 inch paper. Plastic combs are designed to lay flat in both an open and closed position, which makes them great for reading, writing and allows for getting correct margins for photocopying. Welcome to MyBinding video. Here at MyBinding we have a bit of a green thumb. In fact we have a plastic binding comb for any size twinker. Now this isn’t the recommended use of these Kelly green plastic binding combs so we’ll get a little more serious. Ranging from 3/16” to 2”, there’s a comb for any size project. This 19-hole punch pattern is compatible to fit any standard comb binding machine and it’s used with 8 ½ x 11 inch paper, which means anything you print, you can put into your book. Proper use allows for pages to flip easy and lay flat, making reading a breeze and allows getting the right margins for photocopy. These plastic binding combs won’t scratch, chip, peel or discolor. Now depending on your choice of size, you can fit from 1 sheet of paper to 425 sheets of paper for your next book. 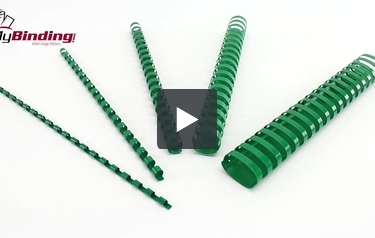 These smooth, glossy Kelly green binding combs are perfect for the day-to-day project. For more demos, reviews and how-to’s, go to MyBinding.com.